What is the control function of the valve? Each valve configuration has been developed to perform certain control functions. Do not expect one type of valve to perform all the valving jobs in a system. 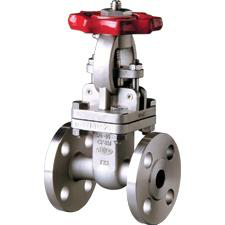 Please pay careful attention that the pressure-temperature ratings of a particular valve are in keeping with the requirements of the service. Pay especially careful attention to the packing and gasket materials as this may limit the rating. Specify graphite or alternative packing and/or gasket materials as necessary to meet or exceed your service requirements. Considerations as to pipeline integrity, future maintenance, corrosion factors, field assembly, weight and safety should be given in determining the method of connecting the valve in the pipeline. The means by which the valve is operated as supplied are shown for the valves in this catalog. Pressure boundary material - metallurgy of the castings and components. Type of valve - gate, globe, check, etc. End connection including wall thickness of connecting pipe if weld end and any special flange facings or finishes. Any material deviations from standard - packing, gasket, bolting, etc. Any accessories such as acid shield, locking devices, chain operation, etc. Manual or power actuators, please include details of requirements.